to be special and meaningful to you. faith, lived in hope, and made eternally new." In celebration of this commitment we set our hands. the work is hard, always seeking grounding in Spirit and community. 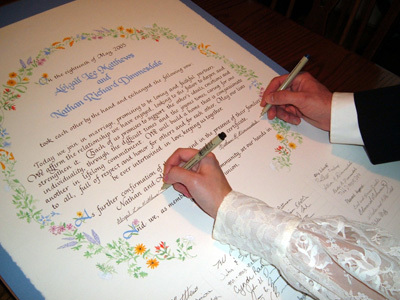 our names in witness and support of this union. a very traditionally worded certificate. and faithful wife so long as they both shall live. Name and Name signed their names below. to celebrate and support this union. partners to each other as long as they both shall live. in caring witness to this union. faithful wife/husband so long as we both shall live". to you with an open heart, and I will love you always. were united in marriage in the manner of Friends. As confirmation of this commitment we set our hands. and to respect our differences with patience, humor and compassion. In celebration of this commitment, we set our hands. a life of integrity and sacred service in the world. and beside the rolling sea, through this life and beyond. through friendship, love, faith and prayer. the bottom of the page, below the witness signatures. and faithful partner. I ask you to be none other than yourself. and we are but witnesses." as husband and wife, for as long as they both shall live. 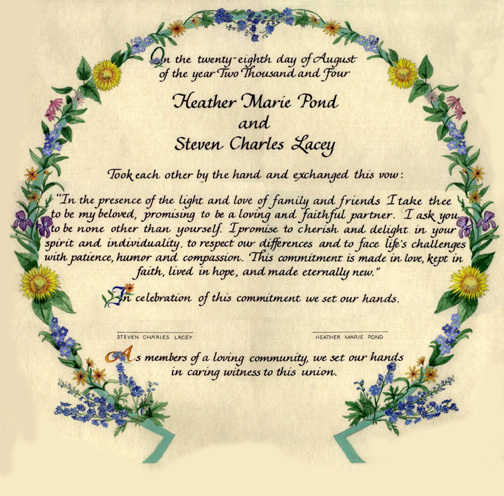 is honoring Christian beleifs and Mother-Earth traditions. at The Name Club in City Name, Indiana. we forever grow young together. It may seem obvious, but make sure you have your date correct and everything is spelled correctly. We check spelling and grammar but you would be surprised how many people have a name spelled wrong in their text. 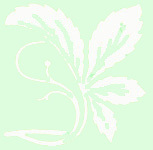 The traditional Friends use of "thee", "thou" and "thy" is a beautiful tradition. While we don't want to tell you how to word your text we often see texts using both "thee" and "you" as pronouns. If you wish to be consistent, choose one type of pronoun. Decide if your certificate will be very formal or more casual. One thing to consider is how you want your names. Do you want just first and last names or do you want to include your middle names or initials. Naturally, full names are more formal. Another thing to consider is the certificate as a document of family history. In this case some couples like to include the names of their parents in the text.